AnimalPets - Should You Let Your Cat Go Outside? You've just adopted a cat who will be your companion for many years. One of the big decisions you must make about your cat's care is whether to allow him access to the outside. You'll find cat lovers on both sides of the indoor vs. outdoor fence. This decision will have a serious effect on the quality of your cat’s life – and may well determine how long your cat lives. Those who live outdoors have a far shorter life expectancy and are at far greater risk of contracting serious illnesses. Long viewed as independent creatures, cats are still considered by many to need the freedom of the outdoors to stay happy. Outdoor living, or even visiting, offers natural stimuli that cats may find exciting and fun – trees to climb, mice and bugs to chase and sunlight for leisurely naps. Cats allowed outside may choose to relieve themselves in the nearest garden thus eliminating the need for you to clean the litter box as often or buy as much litter. The outdoors is an appropriate environment for a cat to exhibit behaviors such as scratching and spraying to mark territory. If your cat exhibits the same behaviors indoors, they become problems that must be solved to maintain a happy and livable household. If you adopted a stray or feral cat (one that has never lived with humans), he may be more insistent about continuing to go outside than a cat that has always lived indoors. A stray or feral cat may be more likely to make your life miserable or cause you to reach new heights of creativity to keep him content indoors. On the other hand, the health of outdoor cats is threatened by contagious diseases such as feline leukemia, feline immunodeficiency virus, feline infectious peritonitis and rabies. Feline immunodeficiency virus, or feline AIDS, for example, is a fatal disease that is carried by up to 14 percent of the cat population. 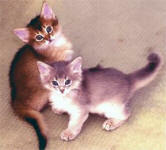 It is transmitted from cat to cat by blood and saliva. This happens primarily through biting so outdoor and male cats that fight with other cats are at greatest risk. Parasites such as fleas, ticks and worms most commonly attack outdoor cats. If you allow your cat to go in and out at will, he will carry these parasites back into your home. Outdoor cats are more likely to contract diseases such as toxoplasmosis, ringworm and roundworms, all of which are zoonotic meaning they can be transmitted to people. Outdoor cats may be attacked by wildlife or free-roaming domestic animals. As unpleasant as it is to think about, they may succumb to traffic accidents, pet-theft, poison, mutilations, traps and animal abuse. Cats living outside must deal with harsh weather and the physical problems that go with it such as frostbite or hyperthermia. Neighbors may not appreciate your cat digging in their gardens or making deposits on their property. As a result, your outdoor cat may be the victim of neighbors who take matters into their own hands. Cats are notorious hunters, and even if fed, may seek out wild prey to satisfy their instinctive urges. The American Bird Conservancy estimates that cats, along with other factors such as loss of habitat by land development, threaten many songbird species. The ABC has developed an initiative to encourage cat owners to keep their cats indoors. Other major animal organizations promote indoor living for cats as well. Sexually intact cats allowed to roam freely contribute to pet overpopulation by reproducing indiscriminately. Perhaps the biggest argument for keeping a cat indoors is his life expectancy, which is dramatically greater than that of a cat living outside or even one allowed out via a pet door or other access method. Cats who live solely outdoors live about three to five years on the average while the average life expectancy of indoor cats is 14 years or longer. If you've adopted a cat from a shelter or purchased a pedigreed cat from a responsible breeder, you may have signed a contract requiring that the cat be kept indoors. Both may follow up with you after a few months to check on how the cat is doing and ask if you are keeping your new companion indoors. Putting an indoor cat out is not the solution to a behavior problem, and letting your cat outdoors is no insurance that he will not develop a behavior problem when he comes inside. Keeping a cat indoors is not completely without risks and is no insurance that the cat will not contract a contagious disease. By weighing all the factors, you will need to arrive at your own decision about the environment – outdoors or indoors – in which you want your cat companion to live.